While the Spiral Stakes (GIII) has only come up with two Kentucky Derby (GI) winners in its 41-year history, it has proven to be a useful starting point overall for many top horses such as Hard Spun, Broad Brush and the filly Serena’s Song. The 2017 edition of the race has drawn a full field of twelve, headlined by King and His Court and Kitten’s Cat. Owned by Gary Barber and Wachtel Stable and trained by Mark Casse, King and His Court has no Kentucky Derby aspirations following a distant ninth-place finish in the Sam F. Davis Stakes (GIII) in his first try on dirt, but Casse regards the colt as his barn’s top prospect for the Queen’s Plate, the first jewel in the Canadian Triple Crown. 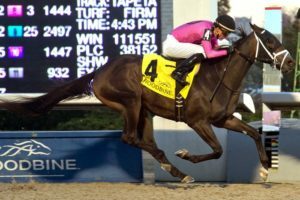 The son of 2011 Breeders’ Cup Mile (GIT) winner Court Vision is a three-time winner over Woodbine’s Polytrack and at distances stretching from five to nine furlongs. While he won’t be utilizing any Derby points he may earn Saturday, with few graded options on synthetic or grass surfaces for 3-year-olds this time of year; the Spiral is a good spot for the colt to get a graded win on his resume. Ken and Sarah Ramsey’s latest Kentucky Derby prospect comes at the hands of young trainer Joe Sharp in Kitten’s Cat. Like many of their past runners, he is a homebred son of Kitten’s Joy and has raced solely on turf thus far. Ken Ramsey is not quiet about his want for a Derby win, though in seven tries, the best finish from one of his horses was when Ten Cents A Shine checked in eighth behind Funny Cide in 2003. This colt will have to prove he can stretch out beyond a mile, with this being his first attempt past that distance. The buzz horse in the race is Anderson Thoroughbreds’ Eddie Kenneally-trained Parlor, a Lonhro colt who is just a neck shy of being undefeated. 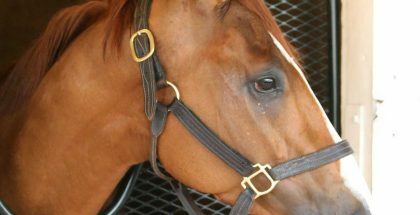 He began his career last August with a powerful victory going a mile on the grass at Ellis Park and was subsequently second, finishing a neck behind winner All Right in the Kentucky Downs Juvenile Stakes. On the sidelines for nearly five months, Parlor returned last month with a 1-¾ length allowance win at Tampa Bay Downs. The colt was a late nominee to the Triple Crown. 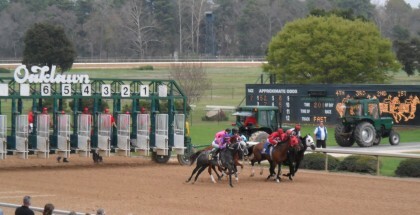 As per usual, trainer Mike Maker holds a strong hand in the race with a trio of colts entered. Kendall E. Hansen and Bode Miller’s En Hanse has a two-for-three record at Turfway Park, including a win in the WEBN Stakes, however all of his wins have come sprinting. Fast and Accurate, also owned by Kendall E. Hansen will be looking to win his third straight after a maiden win at Turfway, and a win in the Sage of Monticello Stakes on the grass at Gulfstream. Three Diamonds Farm’s Shiraz only has one win to his name, a maiden victory sprinting on the turf at Aqueduct last year. Rounding out the field is stakes winner Colonel Samsen, allowance winner Bronson, and maiden winners Giant Payday, Soglio, Convict Pike, and Blueridge Traveler. Carded as the 10th race on the program, the $500,000 Spiral Stakes has an approximate post time of 5:55 pm ET.